The recent crisis over the impeachment of Chief Justice Hilario Davide has strengthened the political clout of the Liberal Party. This was the key message of LP President Butch Abad’s speech in Makati City on November 21, 2003. Speaking at the bimonthly gathering of the FNF Alumni Group, Abad said that one indication for the growing attractiveness of the LP was an increased interest from many sides to join the party. The LP president announced that the President of the Senate, Senator Franklin Drilon, would formally join the party on November 28th, 2003. On a more general note, Abad said that the impeachment crisis has raised the awareness of the Filipino people regarding the importance of responsible exercise of legislative power and the significance of democratic checks and balances. 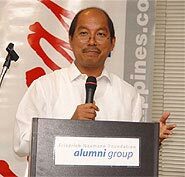 The impeachment crisis, Abad said, has forced us “to revisit and recommit ourselves to basic principles and values enshrined in our Constitution”. From the very beginning, the Liberal Party of the Philippines was in the forefront of the political forces opposing the impeachment efforts. According to Abad, the impeachment efforts were premature, baseless and also unconstitutional. The Liberal leader said that in contrast to the perpetrators of the impeachment, his party was in favour of strengthening the Supreme Court “as an institution, particularly as an interventionist and activist one”.